29 weeks already. I can’t believe I’m almost at that 10 week countdown. There is so much to do before he arrives and something about nearing that 30 week mark is leaving me feeling anxious, excited, worried, happy — basically all the feelings. Baby W is weighing in at about 3 pounds and is about 15.5 inches. He is moving a lot and has a strong, steady heartbeat. I’ve continued to feel so much better since my little scare I had a couple weeks ago. We still don’t know exactly what happened, but I had a terrible, contracting feeling in my side that basically put me on the floor in pain. My whole belly was pulling upwards into me if that makes sense. Both nights I was at the hospital, they checked for signs of pre-term labor, but baby boy is content right where he is supposed to be, thank goodness. The doctors think I tore a muscle in my belly, ultimately causing the spasms. That paired with the baby compressing my bladder with his head and my ureter with his bottom, on top of UTI symptoms, made for absolute misery. That’s what I get for saying pregnancy was uncomfortable in my 27 weeks update. I was fine that morning of the blog post, but in the hospital later that night with that pain! We are working on his nursery a lot more now and officially have his glider on order. I fell in love with it at first sight and can’t wait to share it with you. We want to get started on smoothing the ceilings in the nursery (there is popcorn throughout this old house) and painting the walls. Maybe we will get to that next week or maybe even this weekend. I am thinking Benjamin Moore Classic Gray or Aloof Gray. Really do love the color we used in the master bedroom in our last house, too. Oh, we also had another 4D ultrasound a few days ago! His sweet cheeks. They are so chunky and I love it. He seems to have Brandon’s nose and my lips and chin. He has great eyelashes, and that I can assure you did not come from his momma. His feet are wide like Brandon’s Dad’s and my grandfather’s. He has long fingers, too, and loves to wrap his arms across his face. That’s something Brandon does when he sleeps, so we know where that came from. We were also told that he may have a little hair on his head, which would be a shock since I didn’t have hair until I was almost two and Brandon didn’t have any until close to that age, too. I look at his sonogram pictures so many times per day. I can’t believe how much I can love someone I haven’t met. 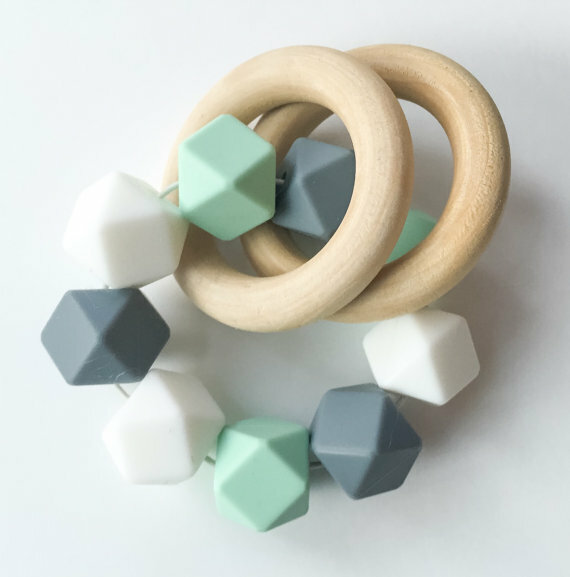 A while back, I shared some favorite baby items I found on Etsy. I had such a fun time scouring the website for the sweetest monograms and smartest designs that I thought I’d give it another go. Can be pink or blue! 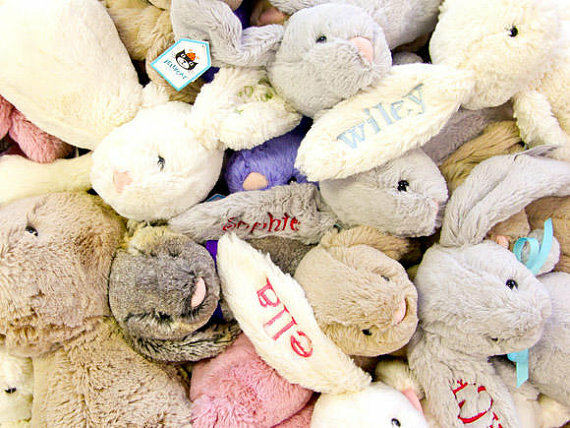 Jellycat has the best stuffed animals and I’m quite partial to the bunnies. 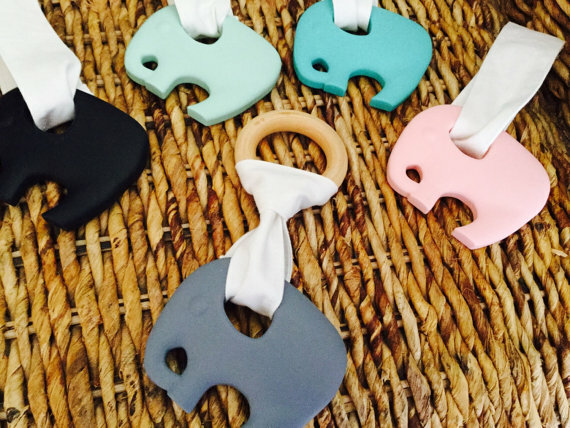 These would be such a sweet Easter basket add-in for a little one. Or anytime—our baby is going to have a cream one at some point soon, promise you that! 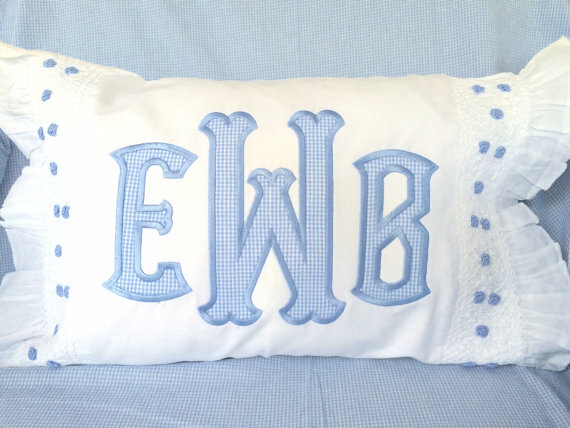 The whole shop has the sweetest monogrammed clothing. This one comes in a jon jon style, too! And how precious is this? Sweetest pillow in the world, I think. 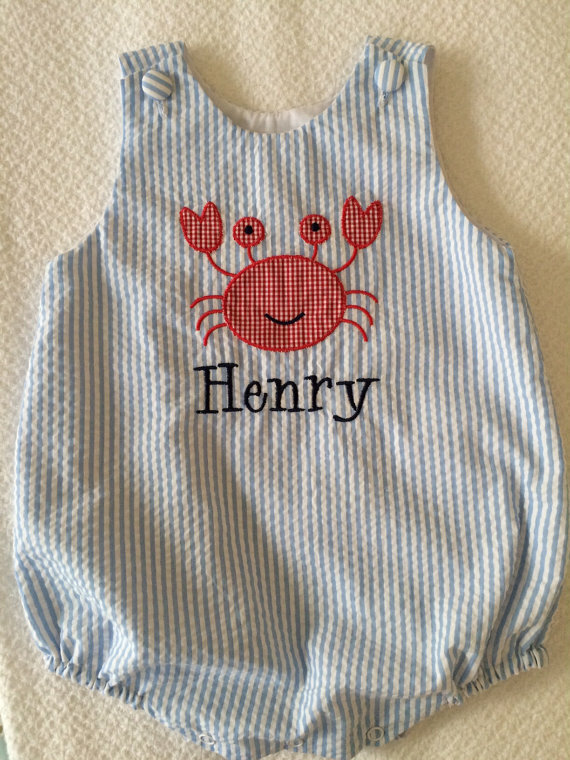 Perfect for a baby boy or girl, although it also comes in pink. Oh man, so exciting! 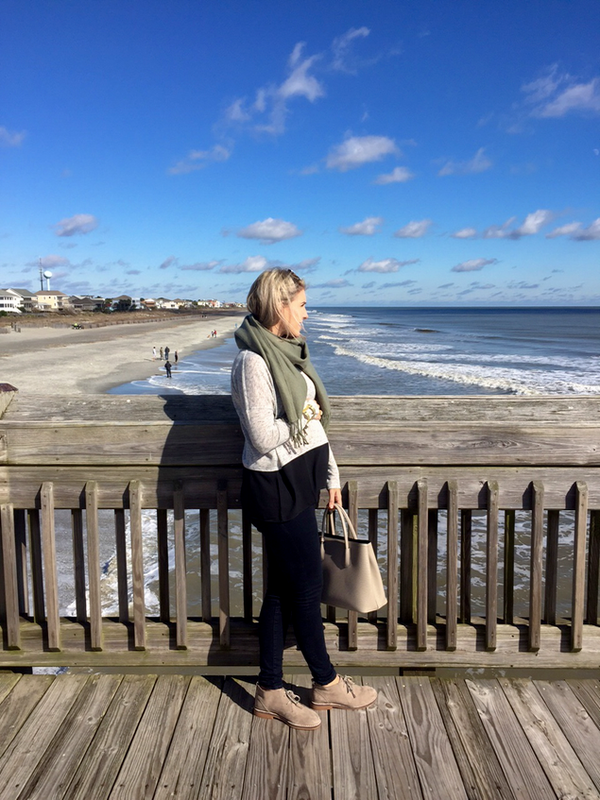 I'm not ready for children yet, but I've found myself becoming increasingly interested in pregnancy over the past few months ( I'm 24) I love reading updates and hearing about people's different symptoms. I'm glad the hospital scare was nothing to worry about! So glad you're doing better and baby boy is alright!! That's scary! 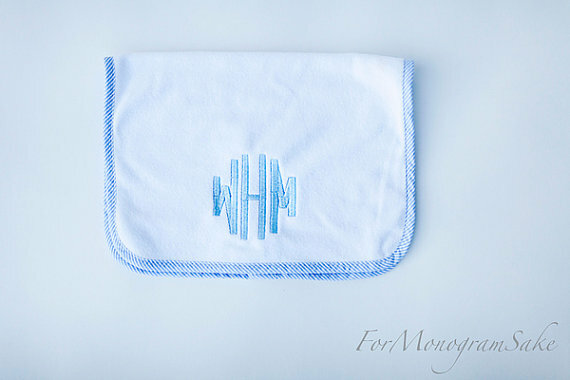 I've been wondering if you ever got that monogram machine that was on your Christmas list? Oh my gosh! Your cute bump!